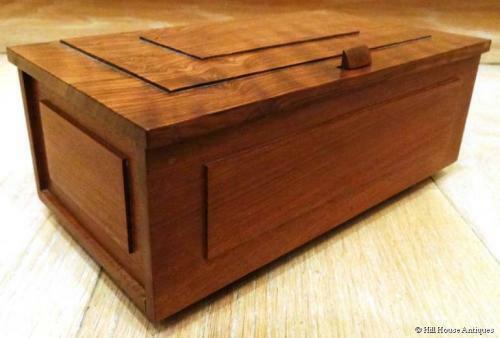 Charming small Cotswold School lidded panelled box in walnut, by Stanley Webb Davies of Windermere; c1950`s. Nicely designed catch to the top; compartmentalised interior. Suitable for trinkets, business cards, playing cards etc. SWD cartouche inside and dated for 1955. Approx 8.5" wide by 5" depth by 3.5" high.